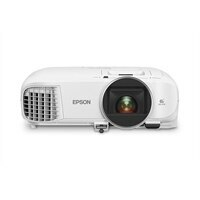 Epson Home Cinema 2100 1080p 3LCD ProjectorFull HD 1080p home theater projector with high contrast and easy setup. Bring the big screen home with the Home Cinema 2100 projector, featuring Full HD resolution and flexible, easy installation. Get widescreen 1080p images up to 11 feet or more — over 4x larger than a 60-inch flat panel. Offering 2,500 lumens of color/white brightness1, the projector delivers vibrant images. Stream movies, games and more with 2x HDMI® ports and MHL®2 connectivity. Portable and powerful, the projector features up to 35,000:1 dynamic contrast ratio — and no rainbow effect. Thanks to its vertical lens shift and 1.6x zoom, you can place it virtually anywhere. Plus, a built-in 10 W speaker means you can enjoy HD content out of the box.